It is with heavy hearts that we must announce that SessMe is closing on April 30th, 2017. It was a very hard choice to make, but despite the overwhelming support of our loyal fan base, it was the way it had to go. We appreciate your participation in what ended up being a very positive experience for us all, and we would like you all to know that it was thanks to you that SessMe made it as far as it did. It has happened to all of us at one time or another. We mistakenly sent a message to the wrong recipient, or to someone we thought we could trust…..and then when the sender no longer controls the message, a total invasion of privacy and great personal distress ensue. SessMe solves this recurring critical problem and many other. Get a taste of SessMe by looking at these images. 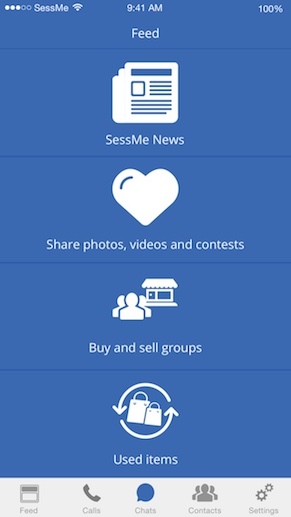 40,1476 User have been using SessMe successfully. Here you can find some information on our most important features. Moving any message or chat to hidden conversations in settings. For restore or delete forever, you can click on settings->Hidden conversations and choose the relevant option. For keeping your privacy, entering hidden conversations asks for a passcode. and all other devices which this message was forwarded. This message will be deleted from any chat in your device and all devices that this message was forwarded to. there is no option to forward or share any message to a third recipient. For your privacy, going out form a private chat, profile picture and the last message are masked. Whenever you click on a chat, it will ask for your passcode. unless you choose to lock this conversation by long click on the group name and choose Lock. 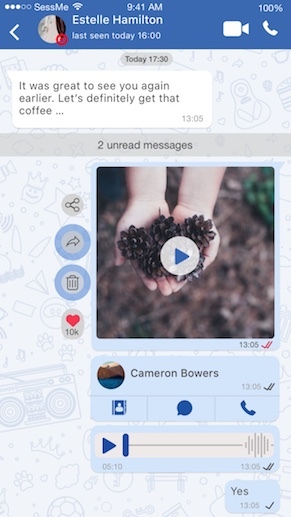 User knows whenever a recipient took a screenshot of his message. 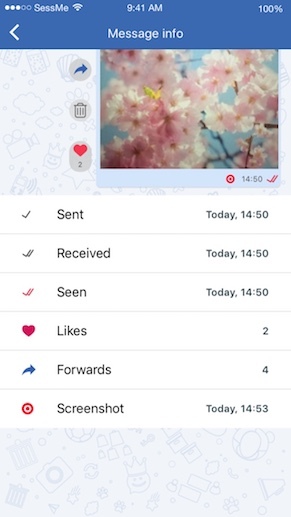 Whenever recipient takes a screenshot, you will see the indication on the message. Screenshot is capable only if the recipient is using an iPhone. Please notice that in order to prevent a screenshot from an iPhone recipient you can click on the contact info, check the photo options, and choose “Get a peek” before sending the image. By clicking on a message info you can see how many times your message has been forwarded. 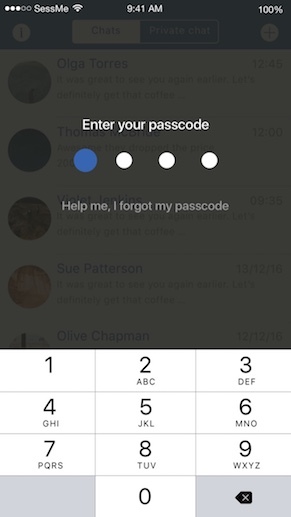 Choosing it on any chat will ask you to enter your passcode whenever you will go into a chat. 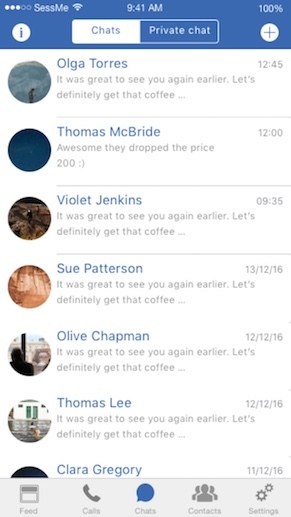 SessMe allows you to choose what message should be shared. to external media outside of SessMe. Please notice that choosing this option, all recipients will be able to store that message on their devices and "Delete Everywhere" will not delete these stored messages. even if it was made without his knowledge. You can report from any device you see that message even if it is not your private device. By long click on any message->info and clicking on "report".